congrats on your wonderful sale, looks great as a pillow! Thank you Alexandra for your support. Thanks Randy for your nice comment. I'm up for another artwork in similar style.. Thank you John for your support. Thanks Barbara for your re-visits. Thanks Noosh for your comment, I really appreciate your support. Toenikunum. 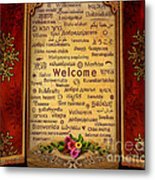 Phoenectic spelling for Welcome in Oahaucan or Mestizo Indian language. Beautiful photo. Voted. I'm glad you added another Welcome to my art..Thanks Susan for sharing it. 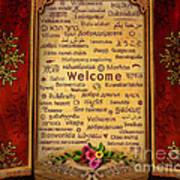 Chose the language you want to read it, welcome to my art Aimee, and thanks for the comment. Thanks Jean for your comment. 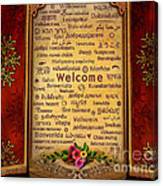 Beautiful welcoming in all languages..
Dhanyavad Uma, my next project will be Hello. The background looks good.Nice! Vote! Thanks Draia, you comment is really appreciated. Thanks Charlie, nice to hear from you..I'm glad that you liked this idea to do a "Global" art that appeal to the world. Thank you Ann, this is the most amazing words I heard about my art, I feel very happy and see others appreciate my art and say it right form bottom of their heart. I'm thankful for your compliments. A very beautiful, complex presentation for a simple and most important message, Bedros! You have done a great job of setting the stage for all of us to give our best to welcome and support each other. I have no clue as to how you create such amazing images as this, but I am happy to sit back and enjoy them fully. Thank you. Thanks Alexandra for visiting my art, and welcome to CFC. Great message. Great image. Voted. 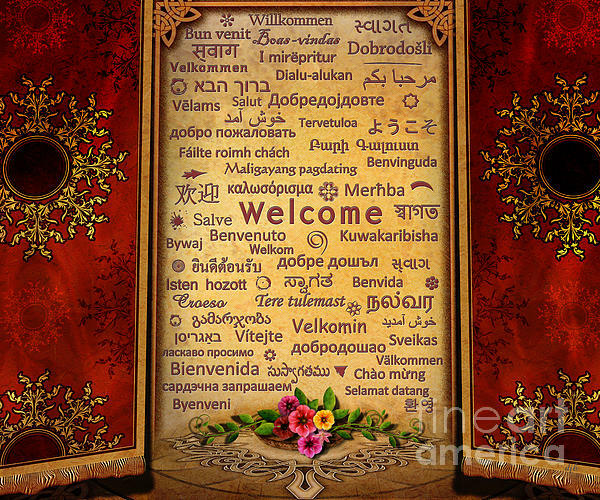 "Welcome" in 57 world languages, (did I count it right?). This is a classic digital design it can be used to display entrance of a building, shop, restaurant or any private business where multicultural community lives. Or simply you like the idea of this art and use it as a wall display or print it as a greeting card. My next project will be "Hello" internationally.